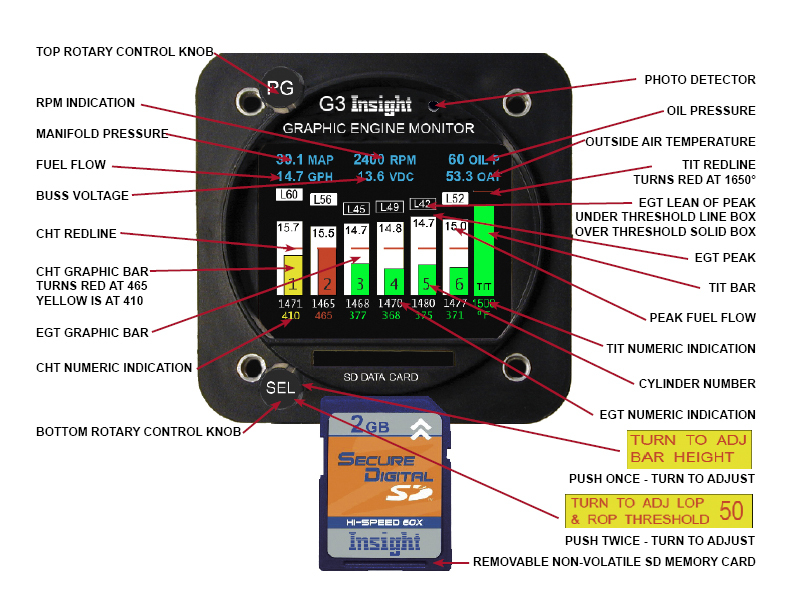 Insight's latest G3 automatically records flight temperature and will also interface with other data sources and report information to other instruments like MFD’s. The data-log files stored on the SD card can be easily retrieved by the pilot, in-flight or post-flight, for instant viewing or permanent record-keeping. 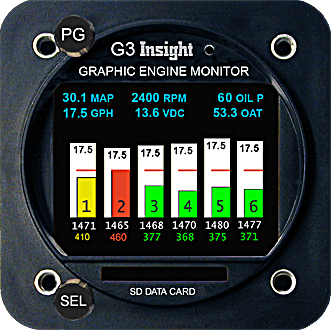 The G3 is a sophisticated tool for engine management. Its microprocessor performs many tasks that used to be handled by the pilot. 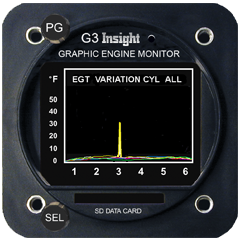 One of the basic functions performed by the G3 is monitoring exhaust gas temperatures for all cylinders with one degree resolution. What is important is the exhaust gas temperature of a particular cylinder in relation to its peak. But peak EGT is not a constant; it changes with atmospheric conditions, altitude, power setting and engine condition and for this reason absolute exhaust gas temperatures in degrees Fahrenheit are quite meaningless. The real objective of mixture management is finding a mixture setting which represents the correct position on the EGT/Fuel Flow Curve. As we will see later, this abstract task is easily accomplished by the G3's microprocessor which samples EGT's for all cylinders many times a second and subjects this data to a complex mathematical analysis can identify peak. 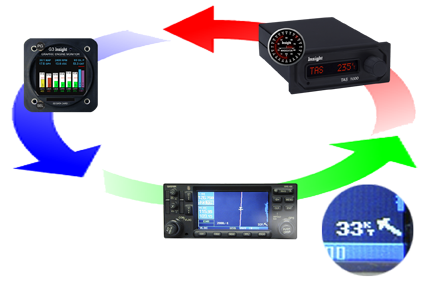 This capability allows the pilot to operate his or her aircraft engine at the most economical mixture settings. 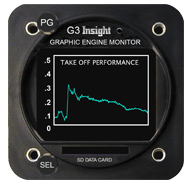 The Graphic Engine Monitor (G3) is ready to operate the moment electrical power is applied. 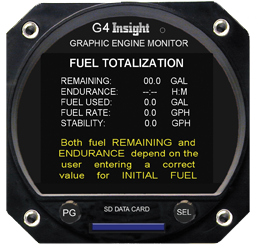 Within seconds after starting the engine, the white EGT bar graph columns will begin to appear on the G3 display. Each column corresponds to the Exhaust Gas Temperature (EGT) of a cylinder. The lowest exhaust gas temperature that can be displayed by the G3 is 800° F. In some engines, the throttle will have to be opened to the fast idle range to get an EGT indication for all cylinders. 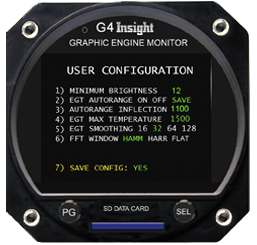 As the cylinder heads begin to warm up, the display will indicate Cylinder Head Temperature (CHT) for all cylinders as a smaller green bar in each EGT column. A horizontal red line across each column represents the maximum allowable CHT. Digital numbers below each bar graph column indicates the exact EGT and CHT for each cylinder. 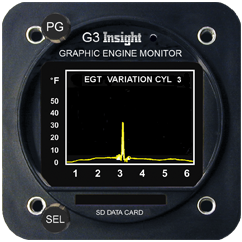 The G3 provides a reliable indication of cylinder head temperature even with the engine shut down. Should an EGT probe fail, the entire EGT column for that cylinder will go blank, and the numeric indication will show --- that is dashes, but the CHT bar will still remain green. The failure of one probe will not affect the display of any other probe. A key requirement of the G3 design was compatibility with previous GEM’s. We strive to never leave our loyal customers behind. Packing all the functionality of the G3 in package half the size of the original GEM took us to the limit of our patience many times but it was worth it. Fortunately its amazingly compact circuits will be built by robotic machines because most of the parts are too small to handle and too difficult to be seen by eye. Products like the modern cell phone have driven the electronic assembly technology we use a long way. 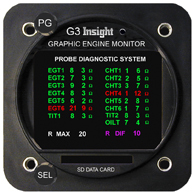 Insight the originator of the Graphic Engine Monitor surprised everyone by unveiling a new third generation GEM called G3 at Sun n Fun. 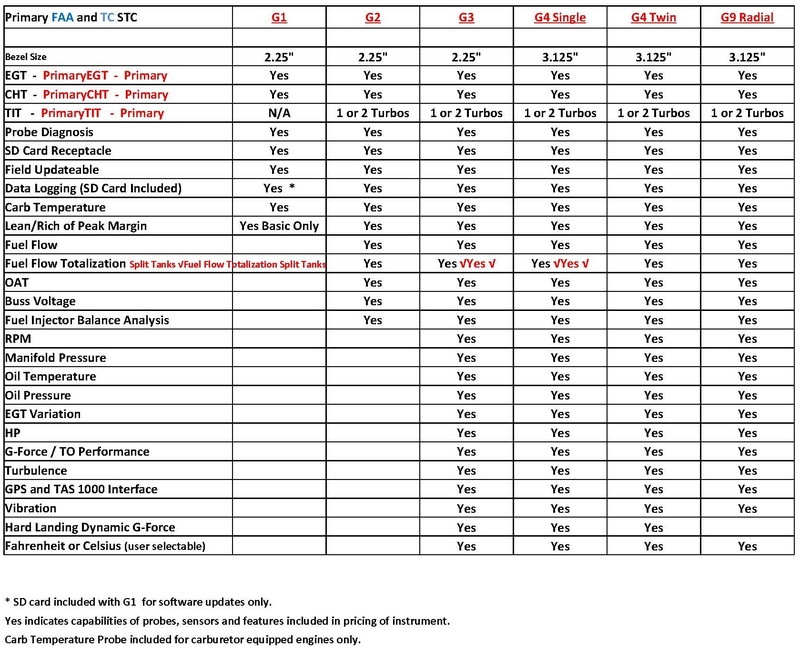 By no means a luke warm sequel the G3 is a breakthrough product. The new G3 writes PC compatible files and directories so no special software is required to process or transfer data. 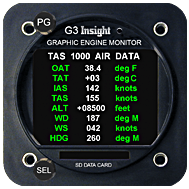 Its extensive data log files include flight data from Insight’s TAS-1000 air data system and nav info from your GPS. Despite its enormous capabilities the new G3 is a compact size and plug-compatible replacement for all previous GEMs. Insight offers a generous GEM trade-in to make upgrades easy. 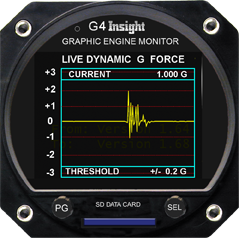 Following the update of the G3 Graphic Engine Monitor to V1.78 or higher, the Vibration Analysis screen will now appear among the supplementary screens when the PG knob is turned. 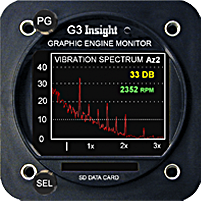 In order for the vibration analysis to function your G3 must be equipped with a vibration sensor and a connection to the magneto for RPM measurement. If your instrument was purchased prior to September 2011, Insight will be sending you a vibration sensor shortly. 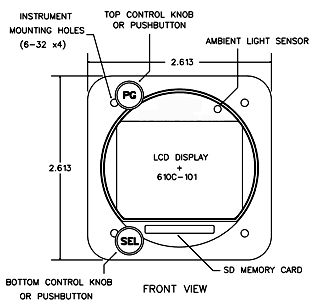 Instruments purchased after this date will ship with the sensor included with the main kit. 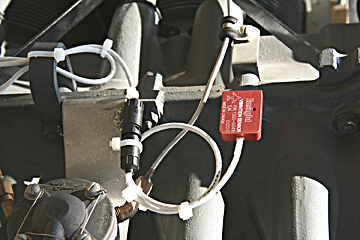 After the electrical connections to the sensor are made, then sensor may be tested simply by powering up the G3 and vibration sensor. It is not necessary to start the engine to perform this test. The sensor LED should flash briefly and rapidly when power is first applied until communication is established with the G3, at which time the LED blinks more slowly (approximately once per second). When the LED indicates communications with the G3 has been established select the Vibration Analysis screen by turning the PG knob. While observing the vibration graph disregard the “RPM Required” message and rap lightly on the vibration sensor with the handle of a screw driver. The graph should register the impacts. Pressing and holding the PG button will trigger the G3 to save the present vibration waveform for future reference. The waveform will be stored as a series of hexadecimal bytes in the current log file. Insight can provide a tool for examining this waveform using Excel or a similar spreadsheet. The tool is presently in the earliest functional stages of development, and will be improved over time. 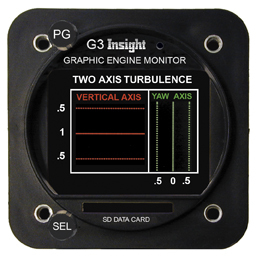 While in-flight with the vibration screen showing on G3. Pressing and holding the PG button will trigger the G3 to save the present vibration waveform for future reference. Hold PG button in until G3 screen says it is data logging vibration data. 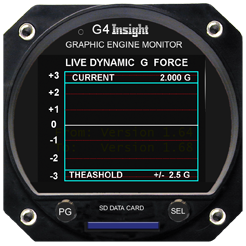 Despite some limitations we elected to put a power display in the G3 graphic engine monitor. To prevent any misconceptions we called it “Theoretical Horsepower”, and under certain conditions it actually does a pretty good job of reporting horsepower. One dependable metric of power is fuel consumption. At peak EGT and leaner where ample or excess oxygen available to consume the available fuel horsepower is a linear function of fuel flow. At richer mixtures where some fuel remains unconsumed and doesn’t contribute its full power potential the simple linear relationship falls apart. Prior to leaning to peak the display is challenged to deliver an accurate horsepower display but once peak has been reached the rich-of-peak accuracy will improve. 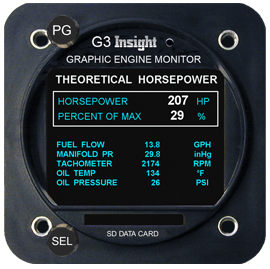 While the G3 does not directly measure true horsepower (remember that no engine monitor does) it does measure the EFFECT of horsepower on takeoff acceleration. This information is displayed on the “Take Off Performance” screen and recorded in the log file too. Acceleration is direct function of engine thrust and other factors like weight, runway conditions, slope and even tire pressure. Of course, ambient conditions like altitude and temperature will affect engine power and therefore take off performance. 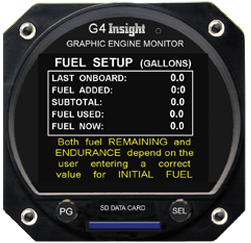 The G3 engine log system has been transformed to a complete aircraft performance logging system.